These founding Head of School will cultivate dynamic collaborative environments to foster excellence and innovation in research, teaching and learning across all discipline areas of their School. Working collaboratively with colleagues, they will lead the future directions of their School by enabling academic staff to achieve research, educational and community engagement outcomes in line with overarching strategic goals. Many of the research interests of the School of Chemistry and Molecular Bioscience map closely onto Molecular Horizons, a large research centre that spans disciplines from fundamental and medicinal chemistry through cell and molecular biology, to neuroscience and studies of the molecular basis of disease. Many of the 60 School members work in the PC2 laboratories within the Illawarra Health and Medical Research Institute, also located on the main University campus. 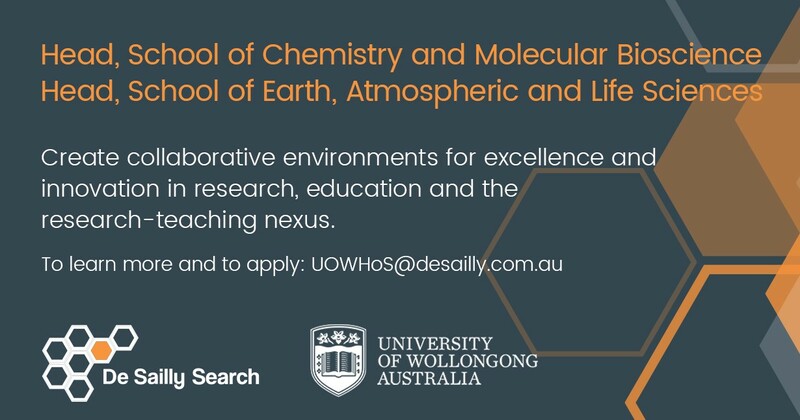 Founded in 1975, the University of Wollongong is a research-intensive institution rated in the top 2% of universities world-wide. The University is a longstanding leader in teaching and learning outcomes in the sciences, with outstanding research in focus areas, particularly these two Schools. Located 80 km south of Sydney in the thriving coastal city of Wollongong situated in the stunning Illawarra region, the University enrols 36,000 students. The Head of School will be passionate about research, education and the research-teaching nexus. Candidates will have academic standing for full professor appointments, and experience in leading a high-performing, multidisciplinary academic group. Ideally they bring experience managing transformational change and curriculum development. The candidate will be able to demonstrate a capacity for vision and long-term strategic planning, especially in regard to taught programs. Full applications must be submitted to the email address above. An introduction briefly summarising your interest in the position, what you would bring to the role, what you would intend to achieve, and what you perceive to be the opportunities and challenges for the new School. A statement of claim of no more than seven pages that systematically addresses the selection criteria (knowledge and skills, and education and experience). The criteria are included in the Position Description. – Full publication list (or ResearcherID/ORCID ID identifiers), and list of up to 10 most significant publications. Applications must include full contact details of between three and five referees who may be consulted in support of their application, as well as statements of their relationship to each referee. Referees will be consulted by the University or the consultant on behalf of the University only after prior consultation with candidates. The University reserves the right to seek reports on the suitability of candidates from experts in the field, other than those nominated by the candidate. Should a candidate not wish a specific person or persons to be contacted, this should be advised at the time of application. It is expected that any regional, interstate or international applicants who reach the final stages of the selection process will be able to relocate to Wollongong to take up the role by the earliest possible commencement date.